Apple may not remain unscathed in the ongoing trade war between the United States and China, with new U.S. threats to levy practically all imports from China entering the country likely to include the iPhone. So far, iPhones have yet to be affected by any of the levies imposed on imports of Chinese goods, including the $34 billion of levies applied on July 6 and another round expected to commence in August valued at $16 billion. A third batch of levies, announced in July and affecting $200 billion in goods, is also thought to only affect some models of the Apple Watch, and crucially not the iPhone. According to experts speaking to the Wall Street Journal, the administration of President Donald Trump is threatening yet another set of tariffs against Chinese imports, this time affecting $500 billion in goods. The threat is also thought to cover practically everything sent from China to the U.S., including iPhones. In 2017, data from the International Trade Center reveals approximately $45 billion worth of mobile phones were shipped from China to the United States for the entire year. 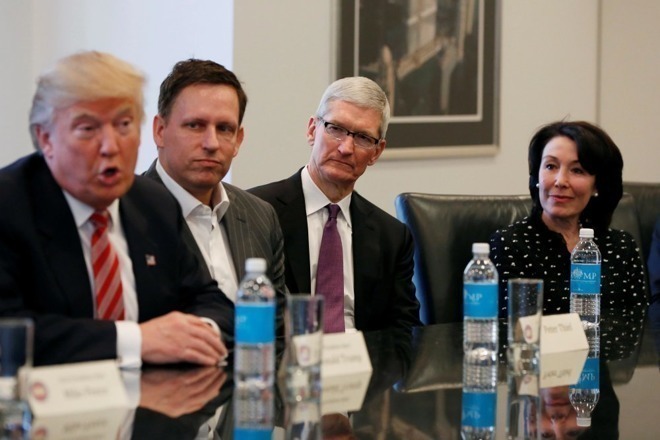 It was previously thought the iPhone would be immune from the trade war, with a report in June claiming Apple CEO Tim Cook was promised such restrictions would not be extended to the iPhone at all. It is unknown if the promise was made by the president or by another White House official, nor when the promise was made. If levies are applied against the iPhone, this would raise the cost to Apple for the China-assembled smartphones into the United States, possibly by as much as 10 percent. Based on an IHS Markit-estimated import price of $368 for the iPhone X, this would increase the cost of the iPhone X by $37, which Apple could either cover by reducing its profit or by increasing the device's cost to consumers. Tariffs against U.S. imports of the iPhone are not the only way Apple could feel the effects of the trade war. If China were to retaliate, there is the possibility it could turn on Apple as a representative of the United States, making its already difficult existence in the market even tougher. China imports only around $130 billion in goods from the United States, making it hard for tariffs to apply to U.S. imports in a similar way, but the experts suggest higher duties against American companies could still be applied. Apple currently occupies 9 percent of the Chinese smartphone market, as well as operating the successful App Store and operating 40 Apple Store locations across the country. These, as well as Apple's willingness to increase its footing in the market, makes the company a potential target for extra fees. At present, there is a value-added tax of 16 percent affecting iPhone imports. It is noted that Apple's supply chain indirectly accounts for 3 million jobs in the country, mostly via partners like Foxconn. Combined with the the 1.5 million app developers in the country, it is suggested this could cause China to be careful about retaliation. "It's like a double-edged sword," said Tokyo National Graduate Institute for Policy Studies economics professor Yuqing Xing. "If the Chinese government really tries to do something, that will hurt itself."